Hello and welcome to The WDW Radio Show – Your Walt Disney World Information Station. I am your host, Lou Mongello, and this is show #335 for the week of September 8, 2013. This week we’ll celebrate Mickey Mouse’s upcoming 85th birthday, and discuss how November 18th became his official birthday. 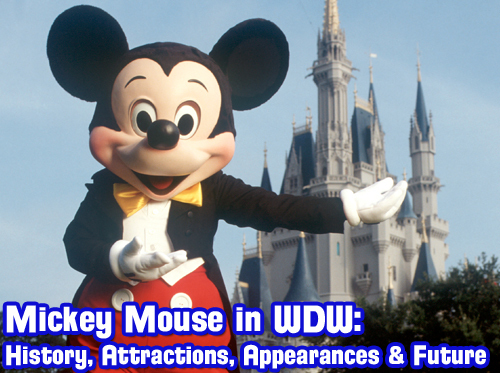 We’ll also look at the history of Mickey in the parks, dating back to Disneyland, and then explore and seek out Mickey Mouse in Walt Disney World. From extinct attractions and character appearances to where Mickey can be found in the parks today, we’ll also discuss the future of Mickey in the Disney parks, and ask you to play armchair Imagineer and design your own Mickey Mouse attraction. Stay tuned as I’ll have some updates and announcements, including details about our WDW Radio E-Ticket Weekend Food & Wine Festival Quest and more of your voicemails at the end of the show. So sit back, relax, and enjoy this week’s episode of the WDW Radio Show. QUESTION OF THE WEEK: If you could design and build a Mickey Mouse attraction in Walt Disney World, what would it be and where? Leave your answer in the comments section below! While I love Mickey Mouse, and WDW is the epitome of him, I do not think that there should be a Mickey Mouse ride. Each ride has its fans and haters, and to keep the World focused on the positive aspect of Mickey, he should not be compartmentalized into a ride. It is almost as if he is the heart and soul of WDW, and to be reduced to a single ride would reduce his importance. Thanks! I would love to see a Mickey ride. I envision a dark ride, perhaps a boat like It’s a Small World or the Grand Fiesta Tour, and you travel through the “greatest hits” of Mickey. Obviously start with Steamboat Willie, then travel through his cartoons and adventures. It would be fun to see how Mickey changes over time. Of course, end it with the tag line “It all began with a Mouse.” I think the best fit for a ride like this would be Disney’s Hollywood Studios because it is showing how animation has changed through the decades. When my wife and I go to Disneyland, we have several rituals we follow. We go through the left tunnel. We visit the firehouse to look at Walt’s window and say hi. Then we begin with a visit to the Main Street Cinema. Many people don’t know you can go in there and watch some of Mickey’s early cartoons. For us, it’s an important ritual, because it reminds us “it all started with a mouse.” (Plus, it’s air-conditioned, which makes it a nice place to duck out of the hot sun.) MSC has a hallowed, almost religious feel for us. I’m sad that Main Street Cinema in WDW has been removed to make another merchandise opportunity. That said, I’d love to see Main Street Cinema at WDW re-imagined for the 21st century. First, give it a more prominent placement on Main Street. Second, make it bigger, so the queue doesn’t clog up Main Street. Finally, it should be edu-tainment, giving guests a history lesson in Disney animation and an opportunity to meet & greet Mickey. I would love to see Disneyland’s Innoventions West converted back into a Carousel of Progress-style theater, with each scene portraying a great moment in the life of Mickey Mouse. Each scene would be highly musical, kinetic and loaded with high-quality audioanimatronics. There could be a supporting cast consisting Minnie, Pluto, Donald, Goofy, etc. Scenes could represent Steamboat Willie, Plane Crazy and other great b&w shorts; the early color shorts like The Band Concert, Through the Looking Glass, The Clock Cleaners and Lonesome Ghosts; The Brave Little Tailor and Mickey & the Beanstalk; The Sorcerer’s Apprentice; highlights from the Mickey post-war shorts; and perhaps a frequently-changing scene at the end showing highlights from the latest Disney Channel Mickey shorts. Perhaps the attraction could be called something like “Mickey’s Shorts” and the exterior could be decorated with gigantic black, white, red and yellow replicas of Mickey’s signature shorts, shoes, gloves and ears. Or it could be called “House of Mouse” and resemble the Club in the old Disney Channel series. Tomorrowland may not be the ideal land for this new attraction, so perhaps the theater could be moved to a new extension of Toontown (since we’re fantasizing about an unlimited budget). I think this kind of attraction would satisfy the desire to be popular for all ages, cultures and abilities. And if I remember correctly, the throughput on the Carousel Theater is fairly high, keeping lines short. Gotta disagree with Jim on this one. I really don’t think Mickey needs a ride. He’s like the mayor. He should ALWAYS be around for a meet and greet but he doesn’t need a ride. Although I do agree he should always have a really cool, nice place for his meet and greet! Mickey was Walt’s great proof that all wishes were within reach. It would be great to have something themed around that. They have that awesome interactive games in the queue for Soarin’. Maybe that kind of tech could be a part of it. Like some kind of motion detection stuff that lets riders interact. Kind of one-upping the challenge of Midway Mania, but less about arcade and more about a responsive ride environment. It would be a great way to tie it back to the heart of Mickey Mouse and the faith in creativity he represents. Nintendo is currently in the middle of a thing called ‘The Year of Luigi’, highlighting Mario’s brother/sidekick in several games focusing on him. In a review of one of them Yahtzee, a reviewer of some renown, contrasted Luigi as the character who can have a personality whereas Mario is the corporate mascot who must be kept safe and boring lest he unintentionally offend some potential game-buying demographic. What does this have to do with Mickey Mouse? Well earlier in the summer I checked out some of the new Mickey Mouse shorts, and I was pleasantly surprised to see Mickey allowed to behave like a three-dimensional character expressing a range of emotions including frustration and sarcasm. It was nice after so many years of Mickey being the squeaky-clean corporate mascot, particularly since Disney’s approach to making Mickey an all-inclusive mascot fit him right into the same ‘boring’ category Mario does. Donald is allowed to get angry, Goofy is allowed to be dumb. What can Mickey do? Be the straight man to everyone and everything else? So I not only like the recent changes like Epic Mickey and the new cartoon shorts, I feel compelled to applaud Disney for taking Mickey out of his safe, bland zone. It’s not about making him appealing to new audiences, but just making him an actual character. I’m not sure a ride would be a right fit for him, though. As much as Disney is trying to make Mickey a proper character, what unique qualities or interests does he have? There’s the Sorcerer’s Apprentice hat and magic powers, but Philharmagic has already utilized that (by putting the focus on Donald, underscoring my point about Mickey being the straight man to the more interesting supporting characters). And I see ideas based on highlighting his career (maybe they could remake the Great Movie Ride into a guided tour of Mickey’s various incarnations), but when Mickey is known more as a mascot than as the star of shorts and movies the potential audience strikes as very small. As in, older people who grew up with the Mickey shorts and people just looking for a few minutes of air conditioned resting. I think keeping Mickey more as a presence in each of the parks than as the star of a specific ride or attraction is the better approach. People recognize Mickey, but there is not yet much to his character to build a story or scenario around. Phillip, I kind of breezed over it in my post about Mickey being “Walt’s Proof”. That’s the thing, Mickey is the core of all conceptual cartoon character stuff. He’s sort of the proto-every character. At some point there were pieces of Donald in him (before Donald), there was maybe even some Goofy with the way he interacted with Minnie. You could compare him to Woody just as easily as you could to Stitch. Moreover, he’s the embodiment of world manipulation, and thus wish-fulfillment. I think to ask what kind of Disney ride you could build around Mickey is to ask what kind of Disney ride would tap into the heart and soul of story-telling. Of course, all that big, macro perspective stuff wouldn’t be ovious. It would just be the energy of the experience. The idea of Mickey tapping into world manipulation/wish fulfillment sort of relates to my point about the Sorcerer’s Apprentice being an iconic portrayal of his, the big dreamer who gets in over his head. And on that front I would say Fantasmic already does a fine job of utilizing that character (though I wouldn’t mind if they updated it a bit; do they still have the Pocahontas scene in the middle of it?). The other major character Mickey can embody is Mickey-as-star/celebrity, and I think a roadblock to any ride/attraction based on that is, as is mentioned in the podcast, the fact that Mickey is not seen by modern audiences as the star of a series of shorts and movie appearances, but rather as a corporate mascot. I wish they had not removed his house. Mickey is the face of the company and the parks. His house was removed for a bathroom and a splash zone. I don’t think you would ever see this happen at Disneyland. First, I’m going to say that I could listen to Jim Korkis talk about the history of Disney World and random facts. Second, I’m heartbroken that they removed Mickey’s house in MK. I felt like that was a staple that I HAD to see any time I was at the World. When I saw Storybook Circus, I was sorely disappointed that it was chosen to replace Mickey and Minnie’s homes. I think it was the perfect place to see Mickey and get a sense of how he lived in the Magic Kingdom. I do agree with Phillip. I think that a specific ride with Mickey would be nailing him down to one location, when we know that Mickey can be seen all over the parks. I would have a Mickey Mouse themed water ride. This could be a light thrill ride that also highlights the history of Mickey Mouse. You could ride in a boat style car/raft “captained” by Steamboat Willie, as this would allow some older clips and rarely seen Mickey’s to be highlighted as part of the queue entertainment. Once in the boat, you could travel through various scenes featuring Mickey and friends in “wet” situations where riders could be lightly splashed/sprayed. As a culmination,you could finish with Mickey’s most famous water scene – Sorcerer Mickey in Fantasia, and include lots of splash opportunities. As you could include all era’s of Mickey’s (including the recent video game/clubhouse versions),it would allow kids to see the history and importance of Mickey through the years,while at the same having fun on a new water ride. I personally think a Mickey Mouse ride would be great. I think to play it safe so there are no dislikes and negativity towards Mickey, have the ride display history of how Mickey came to be and is now. Magic Kingdom is actually a step into time because as you walk down Main Street, you enter new time periods and the years keep going up. Mickey’s ride should be similar as you progress. This would not only give the history about Mickey to the younger generation but also let those who have known Mickey for years reflect upon his existence over the years. Nowadays, we are a very hands on generation (reason Toy Story Mania is so popular) so make the ride hands on as well. Hand motions as you ride through as you sort of “paint” the picture of history. At the end of the day, you have to trust Disney and what they would put together. If I could design a Mickey attraction it would have the theme of “Mickey Through the Years” and would include Walt as well. Not sure about the name. Would start out with much in black and white and work its way up to full VIBRANT color modern Mickey. The ride vehicle would be shaped similar to Mickey’s red pants with yellow buttons and a black overhang. Overall shape would be similar to the doom buggy, to conceal what lies ahead. As you move through the attraction, things would become more whimsical, combining up and down motions as well as tilts and rotations. All would be very slow and young child friendly. Background music would be very whimsical as well. Old cartoon footage as well as animatronics would be included. Lots of bold color as the ride progresses! All sensed would be fully engaged! And there would be a Steamboat Willie Mickey animatronic to greet riders in the queue line AND a modern animatronic Mickey to say goodbye as they leave their ride vehicles at the end of the attraction. The main purpose of the attraction would be to create awareness and educate our youth about the greatest animated character EVER! And it would have to be located at the Magic Kingdom in Fantasyland, of course. Thanks again for another great show, Lou and Jim!! !